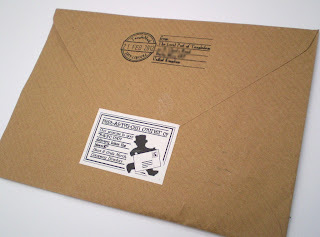 Stamps and Strings is the new packaging feature on this blog, and I wouldn't be mentioning it if I didn't already have a feature! 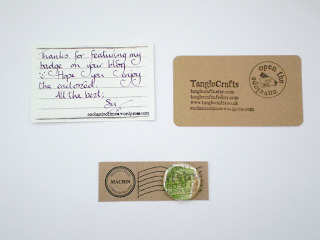 Only yesterday, I included these stamp badges by Tangle Crafts on Etsy in my favourite feature, and when I asked her a few days before if she'd mind if I included her, she graciously accepted, and even offered to send me a badge so I could see it myself! I've always loved post - sending and receiving it. 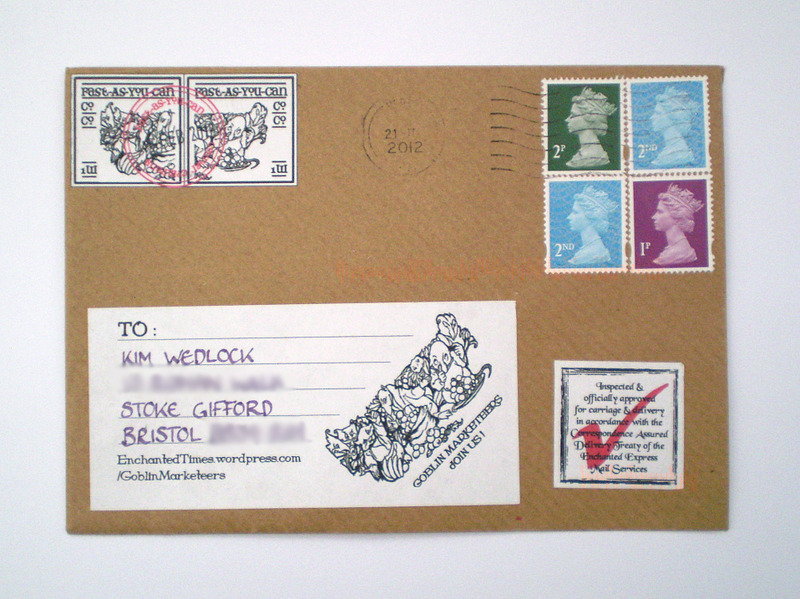 When I was little I was so desperate to get a letter in the post because that's what I thought being grown up was like (these days they're mostly bills or spam, so I realise, in the most part, that my assumption on how exciting it is to get letters was a little bit wrong) that I sent letters anywhere that I had an address to. 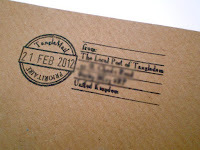 Well, I exaggerate, not every place I had an address to, but I would go onto websites of my favourite shops and find their addresses to tell them how much I loved the stores, through hopes of one day finding an envelope with my name on it at the foot of the door. And it worked, but most of the time they were formal thank yous for my interest. Not exciting enough for a ten year old. But then, I sent a letter to Millie's Cookies. I loved their cookies when I was little, and while I still do now, I am also a little more aware of my waistline...though admittedly it doesn't stop me much. I just run twice as far the next day :P But I sent them a letter expressing my love for their cookies. 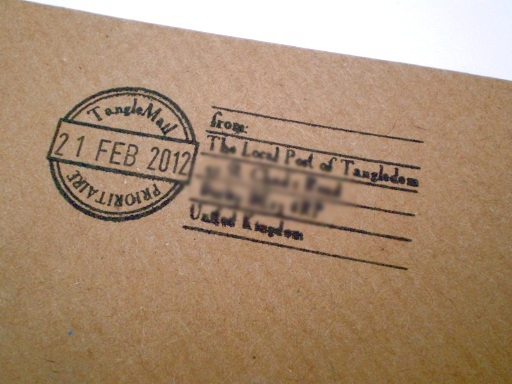 I don't remember what it said, or if it was even spelt correctly, but a week later a letter came through the door for me. It was from them. And it wasn't a formal thank you, either. 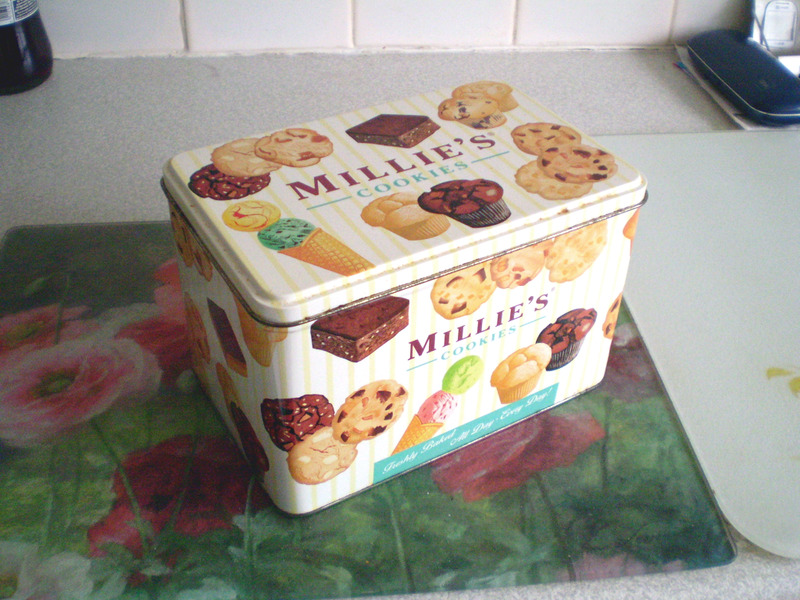 It was handwritten from the manager of the local shop I sent it to, and with it came a voucher for a tin of Millie's cookies worth £20! So, naturally, I went there as soon as possible and used my voucher. It was a proper cookie tin they gave me too, as you can see! I think I might have tried to get a second voucher afterwards by sending a similar letter to a different office, being a greedy little child, but it never worked :P To this day I still remember it, and I always will. Not because I love cookies, or because I got a freebie, but because there was someone sat in an office that looked kindly upon an innocent little child who liked their shop's cookies, and rewarded them. I'm glad they didn't give in the second time, because it says something about the person who was in charge of the initial office. Anyway, back to the point. I love post, but as I said, lately it seems to be mostly junk mail. 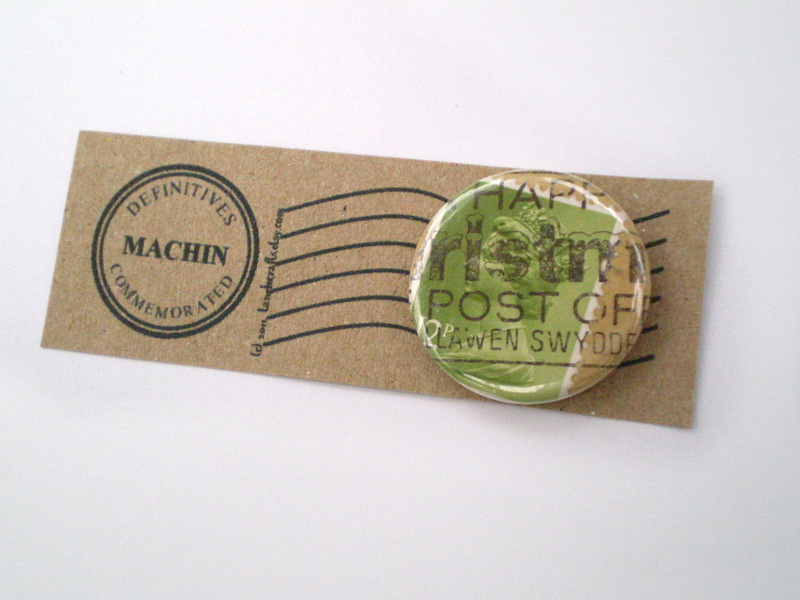 I envy isavirtue, because Kaitlyn always gets such beautiful, handmade mail. In fact, go over there this week and have a look at the entries she's had for her handmade valentine mail art competition! They're so unique! 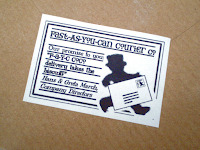 But this morning, a lovely little envelope dropped through the letter box (along with a maplin's catalogue. The last time I went in there I was returning something xD). At first I thought little of it, but that was before I had a proper look. 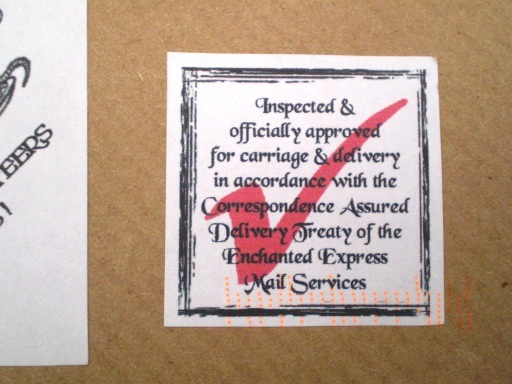 Only the top right corner is actual postage. 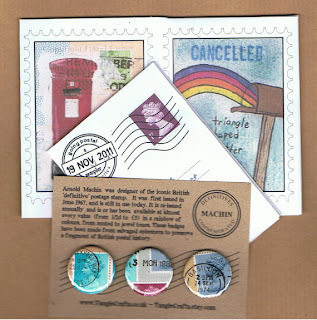 I had just assumed that the top left and bottom right were additional stickers from the post office, until I remembered that Tangle Crafts is also based in the UK - you'd think it would have been obvious by the stamps, but it did slip my mind. What you need to know about Su Mwamba is that her shop is full of little fantasy 'zines, and a couple of fantasy membership clubs including the Goblin Marketeers and the S.P.O.B (Society for the Preservation Of Borrowers). She's so clever. I love it when people make things like this, when you know that it's fake, but the seller will blindly try to convince you otherwise. I've seen cases where it doesn't work - glass bottles filled with glitter is no pixie dust. To succeed with things like this, you have to be original. 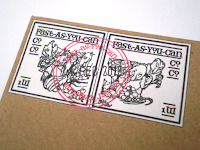 And these zines are original. In fact, I fully plan to subscribe myself to the S.P.O.B to help the little fellows. But once again, I stray from my point. 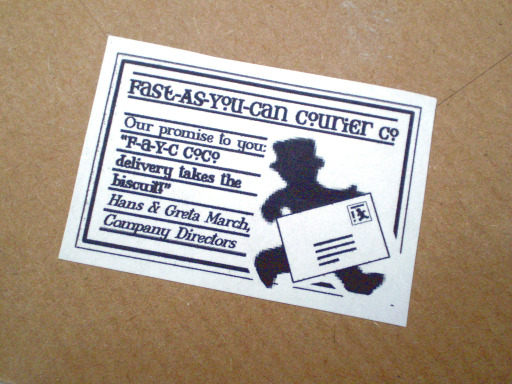 She's created all these "postage" stamps and stickers for her delightful little "courier" service - purely for the use of her own packaging. 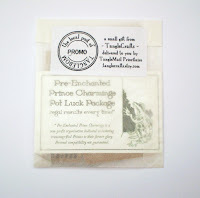 Now, I love to see people spread their creativity from their products to their packaging, but she's done so in a way that her packaging could also be the product! I love that! 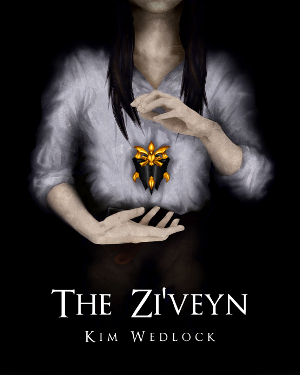 And all of her work has this Terry Pratchett undertone that I just adore, which makes it ever more appealing. And what was in the package was just as good! 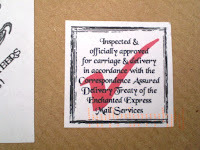 It was indeed the badge she had said she'd send me, along with a little note (written in gorgeous handwriting) that was written on the back of a business card. Except the business card was advertising services to restore "transmogrified princes to their former glory". Marvellous. 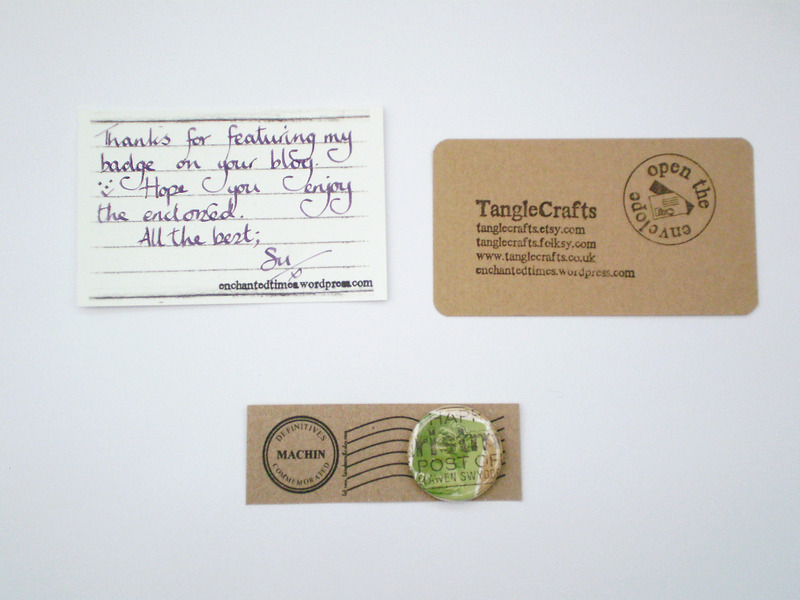 The badge is wonderful and so cutely small, I am rather fond of it ^^ She has other colours in her shop, and she's just recently listed sets of three that come with a mini zine and are also wonderfully packaged for a wonderfully reasonable price. With postal accessories on the rise, you can't be without them!